We all tend to live in a very small bubble of people we socialise with (both face to face and via social media) and of the locality and workplaces we frequent. This can give us a very distorted data about the world we live in. It is therefore often important to look at the ‘bigger picture’. Having said that it is also important to realise that this ‘bigger picture’ is a aggregate of different factors, some of which could be positive or negative. For example the Gross Domestic Product (GDP) or even average wage could be going up but that does not mean that everyone is getting richer – there could be a sizable number of people who are getting poorer. For example if you shop in Lowestoft High Street you may see a lot of relatively young, poor mothers. It is then easy to over estimate the number of young mothers in the overall population. If you shop in Waitrose then you are more likely to see older more prosperous mothers. However, you may be influenced by news paper articles talking about the ‘growing problem’ of teenage pregnancies. I am not going to go into this in any more detail at the moment1 since I was just using it as an example of how our own experience can often deceive us when assessing such questions. 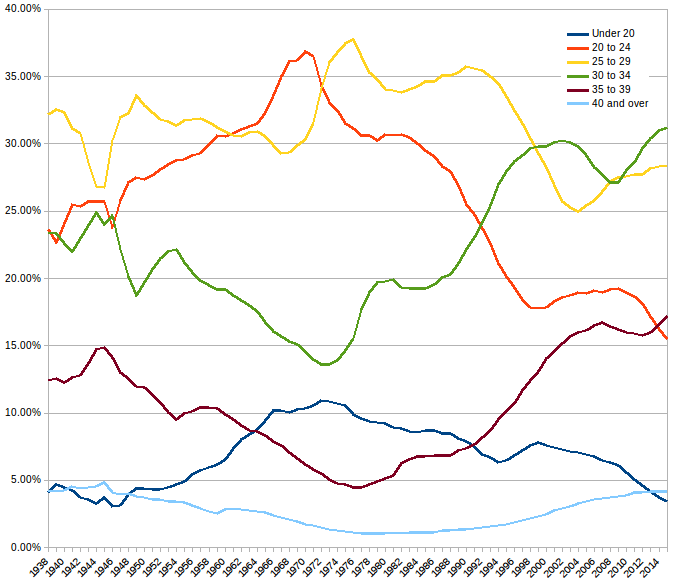 Having said that here is a graph of the Live births by age of mother. Note that only 3.43% of children were born to mothers under the age of 20 in 2015 the peek for this age group was in 1972 at 10.9%. There are quite a few other reasons why we have to question ‘our own eyes’. If we are told that there is a problem of ‘teenage mothers’ it could be that we tend to notice them a lot more. So unless you do careful sampling you may just be noticing them and not older mothers. Something similar happens with what is called supermoons3. The moon’s orbit is elliptical so its apparent size changes. A lot of photographs are taken on the day of the ‘supermoon’. However, the size compared to the previous and next full moon, may not be that different. It is only because it has been brought to their attention that people go out and see this amazing moon. 1 I may write a blog on this at some future date. I think it is interesting how it is nearly always framed as a problem and that the cause is the ‘massive’ amounts of benefits that young parents can receive.